This book is not an academic work. It is not a history lesson or a sociology lecture. If it has any intention at all it is simply to prove amusing and diverting for a short while without reaching any serious conclusions, but if it helps show the Victorians in a new light and challenges a few modern stereotypes, then that will be a bonus. 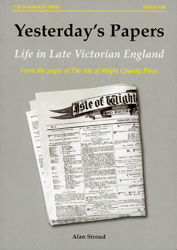 Other than that it is not meant to have any serious intent or any particular educational merit; it is simply a collection of articles drawn from the Victorian editions of the Isle of Wight County Press that seemed too good to stay hidden away in archives. No more, no less. The articles have been chosen for a variety of reasons, the majority of them purely and simply for their historical interest. Others were selected because they were amusing and a few were chosen because they were horrifying – on some occasions they manage to be both at the same time! Finally, some deserved inclusion just for being plain quirky or curious, or for showing the Victorians in an unexpected light. V They are first hand accounts of the day to day life of Victorians, written with surprisingly few inhibitions and often in the smallest and most revealing detail/ This is the Victorians writing about themselves. A5 format, 176 pages, 47 illustrations.